David Haussler, professor of biomolecular engineering and director of the Genomics Institute at UC Santa Cruz, has been chosen to receive the Dan David Prize, a prestigious international award endowed by the Dan David Foundation and based at Tel Aviv University. Haussler will share the $1 million prize with two other leaders in the field of bioinformatics. The Dan David Prize recognizes and encourages innovative and interdisciplinary research that cuts across traditional boundaries and paradigms. It aims to foster universal values of excellence, creativity, justice, democracy and progress and to promote the scientific, technological and humanistic achievements that advance and improve our world. Haussler and the other laureates will be honored at a ceremony in Tel Aviv on May 17, 2015. The prize recognizes human achievement in three areas: the past (fields that expand knowledge of former times); the present (achievements that shape and enrich society today); and the future (breakthroughs that hold great promise for improvement of our world). Each year an international board chooses one field within each time dimension. In addition to Haussler, the 2015 laureates for the future time dimension in the field of bioinformatics are Michael Waterman, a professor of biological sciences, computer science, and mathematics at the University of Southern California, and Cyrus Chothia, an emeritus scientist at the MRC Laboratory of Molecular Biology in Cambridge, U.K.
Joseph Klafter, president of Tel Aviv University and chair of the Dan David Prize Board, said in a video announcement of the prize laureates, "Professor David Haussler presented the first draft of the human genome sequence and developed the Genome Browser used worldwide for interpreting genome sequences. The browser includes tools for identifying and comparing genes, for accessing information on gene structure, function, and regulation, and for revealing gene-disease relationships. 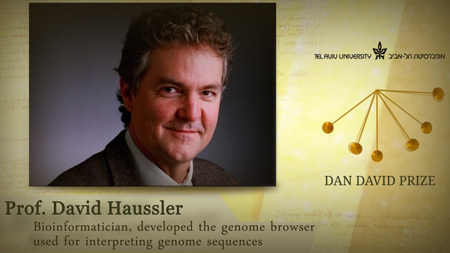 Dr. Haussler introduced machine learning techniques to bioinformatics, becoming a central paradigm in the field." The 2015 prize for Retrieving the Past: Historians and their Sources will be shared by historians Peter Brown and Alessandro Portelli, and the prize for the Present: The Information Revolution will be given to Jimmy Wales, cofounder of Wikipedia. Haussler is a Howard Hughes Medical Institute investigator and has received many awards and honors for his work, including the 2011 Weldon Memorial Prize given by the University of Oxford. In 2009, he shared the Curt Stern Award from the American Society of Human Genetics with James Kent, a research scientist in the UC Santa Cruz Genomics Institute who played a central role in assembling the first working draft of the human genome sequence and developing the UCSC Genome Browser. Haussler joined the UCSC faculty in 1986. He is a member of the National Academy of Sciences and American Academy of Arts and Sciences and a fellow of the American Association for the Advancement of Science and the Association for the Advancement of Artificial Intelligence.